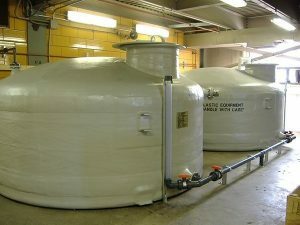 Pulsair’s fast, energy efficient and non-corrosive sodium hypochlorite tank mixing solutions. Sodium hypochlorite is commonly used in wastewater applications where sterilization or disinfection are necessary. Due to the high corrosiveness of sodium hypochlorite it is more cost effective to choose a mixing system that avoids contact with all metals including stainless steel. Pulsair mixing systems address the issue by using PVC and polyethylene for in tank parts. Mechanical impellers blades must use expensive & exotic materials to be sufficiently corrosion resistant. The same is true for the internal parts of recirculation pumps. 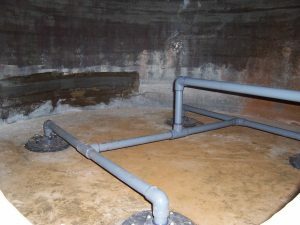 The stratification of the hypochlorite in FRP or “poly” storage tanks requires very light and short mixing periods prior to use. Pulsair mixers are specifically designed to provide this type of ‘continuous intermittent’ mixing. Maintenance free – traditional mechanical mixers require maintenance programs, frequent repairs, and stocking of spare parts all due to the stress of mixing. Pulsair bubbles are not prone to stress, so Pulsair mixers are virtually maintenance free.